Drum Corps International will provide a LIVE WebCast of the 2007 Division I World Championship Semifinals on Friday, Aug. 10. 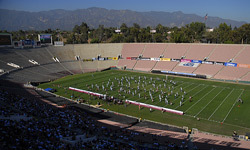 This event is part of the 2007 DCI World Championships presented by A.J.Wright from Aug. 7-11 in Pasadena, Calif. Presented by Gary P. Gilroy Field Show Publications, this WebCast will feature 17 competitive performances from the top corps in Division I. Also included in the WebCast will be special World Championship recognitions and an encore performance by the Kingsmen Alumni Corps. All times Pacific time zone and subject to change. View the complete schedule and competing drum corps in order of appearance. Two options are available to view this WebCast. DCI.org Fan Network Platinum Members have full access to LIVE WebCast events all season long in addition to other exciting benefits. Sign up today for a Fan Network Platinum Membership. Those wanting to view just the Division I World Championship Semifinals can purchase the single event Pay-Per-View option. Purchase a Pay-Per-View pass to watch the DCI Championship Division I Semifinals. DCI.org technical support will be available online just before the beginning of each WebCast to assist those who may experience technical difficulties prior to the start of performing corps. Please review this list of frequently asked LIVE WebCast questions before purchasing a Pay-Per-View pass or Fan Network Platinum Membership to view this event.